Saint Augustine’s Church in Lethbridge is a parish within the Anglican Church of Canada, which is itself part of the Worldwide Anglican Communion, active in 164 countries, and comprising about 80 million members. The Anglican Church of Canada, like every national Anglican church, enjoys complete autonomy. We govern ourselves. We are, however, bound to other national Anglican churches by our history, and by four “Instruments of Unity”: the spiritual leadership of the Archbishop of Canterbury in England; the Lambeth Conference, held every ten years; the Anglican Consultative Council, and occasional meetings of the Presiding Bishops of national churches. Thus the Anglican Communion functions more like a world-wide club than a corporation. There is a great variety of parishes within each national church, but every Anglican parish holds a few things in common: we recognize the Holy Bible as the basis of our faith; we recognize the Apostles’ and the Nicene Creeds as binding statements of Christian belief; we recognize the sacraments of Baptism and Holy Communion; and we claim the historic episcopate, the continuity of Bishops, which stretches back to the time of Jesus himself. In broad terms, “Anglican” means “English,” and there has been a Christian church in England since the 4th century AD. The very first English Christians were probably Roman soldiers serving in England. In such places as Northumbria and Iona, Christian communities developed independently of Rome, and this tradition of celtic Christianity continues to enrich our church to this day. For most of its history, England, like all of western Europe, was governed spiritually by the Roman Catholic Church. Then, in the 16th century, the English church was reshaped by the Protestant Reformations. Beginning first in Germany, and quickly spreading throughout northern Europe, Protestants criticized many of the doctrines and practices of the Roman church. There were also cultural and political differences that led many national churches to seek independence from Rome. With the invention of the printing press, Bibles, often translated out of Latin into vernacular languages, could be easily and cheaply produced. Greater literacy allowed more people, in more countries, to question current religious practices. The advent of a truly English Bible encouraged the formation of an independent English Church. Martin Luther began the Protestant Reformation in Germany in 1517, and the Lutheran church soon became independent of Rome. The English Reformation began at roughly the same time, but took much longer to be accomplished. It began, rather awkwardly, when King Henry VIII sought an annulment of his marriage to Catherine of Aragon. The Pope, for political reasons, could not grant the annulment: Catherine was Spanish, she opposed the annulment, and the Pope could not afford to alienate the Spanish crown. Henry’s frustration with the Papacy, combined with long-simmering theological disputes with Rome, led to the inevitable split. In 1534, the English Parliament declared Henry VIII to be the Supreme Head of the Church in England, but even this Act of Supremacy did not resolve things permanently. There followed almost a century of conflict between Protestants and Roman Catholics in which the unique character of the Anglican Church was formed: we became a church both catholic (with a small “c”) and Protestant, both Episcopal and Reformed. The Anglican Church is a Protestant church. We do not, like our Roman Catholic brothers and sisters, recognize the Pope, the Bishop of Rome, as having authority over us. In the Anglican Church, both men and women may be ordained as clergy, and all clergy are free to be married. There are other doctrinal differences between the Roman Catholic and Anglican Churches, though many of these are differences more of emphasis than belief. For a Protestant church, however, the Anglican Church often appears very “catholic,” and this is so because the English Reformation was not a simple repudiation of our shared Roman Catholic past, but a true reforming. There is a great deal of Christian history and practice that we hold onto with conviction. The Anglican Church practices the same patterns of worship, reads the same Bible, sings many of the same hymns, and celebrates the same sacraments as we did before the Reformation. The Anglican orders of Deacon, Priest and Bishop continue the practices of the ancient church, and the Apostolic Succession, the laying-on of hands from Jesus to his Apostles, and from the Apostles through to our current Bishops, continues. Anglicans remember and celebrate the Christian Saints throughout history. The Roman Catholic and Anglican Churches, as well as many other Protestant Churches, share the same Revised Common Lectionary, which determines which readings from the Bible will usually be spoken at Sunday services. Such commonalities between Anglican, Roman Catholic, and many Orthodox and Protestant Churches allows for dialogue and cooperation between our communities. The Church of England arrived in Canada through the first English explorers and fishermen and settlers. The first recorded Church of England service in our country was a celebration of Holy Communion held at Frobisher Bay in 1578. In 1787, Charles Inglis of Nova Scotia became Canada’s first resident Bishop. As European settlement of our country began, spreading largely from east to west, and from south to north, so the Anglican Church became established across the land. St. Augustine’s, Lethbridge was founded on October 6, 1886, when, on the corner of 2nd Avenue and 8th Street South, sod was turned to construct a permanent church building. Lethbridge was then a very different place. It was, to begin with, a frontier town called Coalbanks, in a sparsely-settled part of the Northwest Territories. We were then part of the Diocese of Saskatchewan, for the current Diocese of Calgary did not yet exist. In 1937, St. Augustine’s merged with another Anglican parish in the city, St. Cyprian’s, and their church building was moved near the corner of 11th St. and 4th Ave. to house the combined parish. In 1958 a new St. Augustine’s Church was built next to the old building, and the former St. Cyprian’s became our Church Hall, which purpose it still serves. In 2004, St. Augustine’s merged with St. Mary-the-Virgin Anglican Church. Our growing church family has inspired a major renovation of the main building, and construction is currently taking place. The project is on budget and on time, and we expect it to be completed this fall (2015). 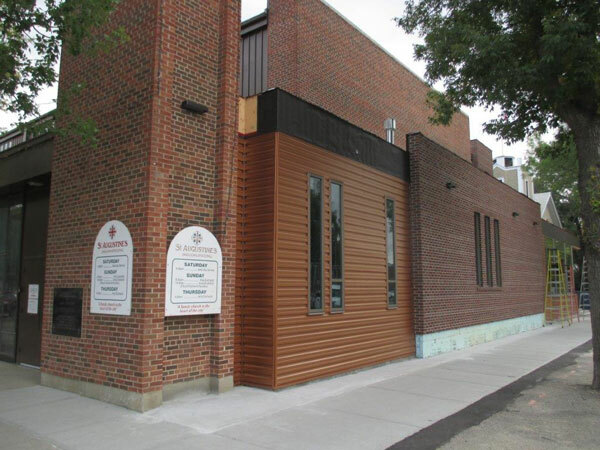 This renovation, which will make the church completely accessible to those with disabilities, will include an elevator, a barrier free washroom, an expanded gathering area (narthex), a new prayer chapel, and a newly renovated nursery and kitchen.